In the past two seasons under Brian Ferentz, the Hawkeye offense, specifically the passing game, has grown to new heights. 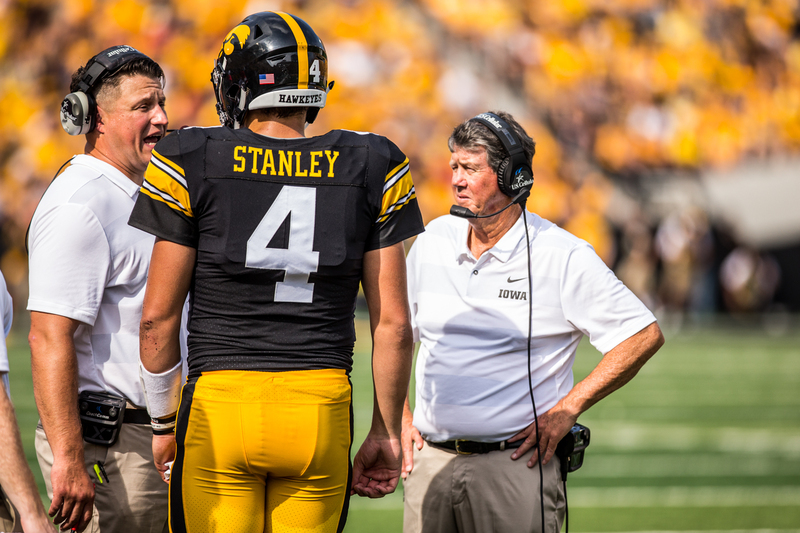 Iowa quarterback Nate Stanley talks with offensive coordinator Brian Ferentz during Iowa's game against Northern Illinois at Kinnick Stadium on Saturday, Sept. 1, 2018. 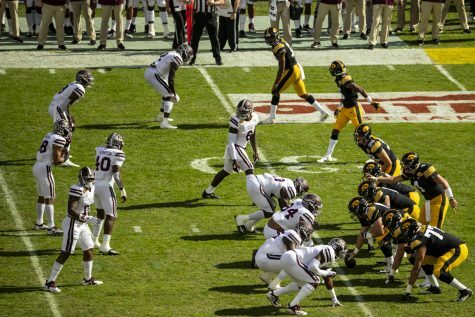 In former Hawkeye offensive coordinator Greg Davis’ final game at the helm, Iowa produced just 226 yards of offense in its 30-3 loss to Florida in the 2017 Outback Bowl. 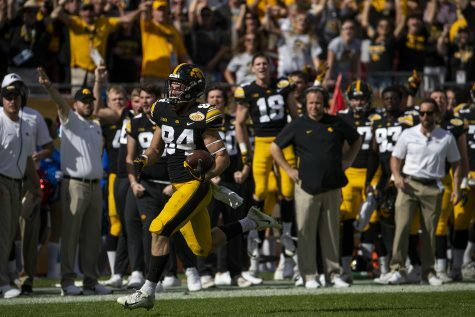 Iowa’s ground game did what it normally does — the Hawkeyes rushed for 171 yards, with starting tailback Akrum Wadley averaging 5.2 yards per carry. But in the passing game, things fell apart. The Hawkeyes completed just 7 of their 24 attempts, for 55 yards. Fast forward to the current season. 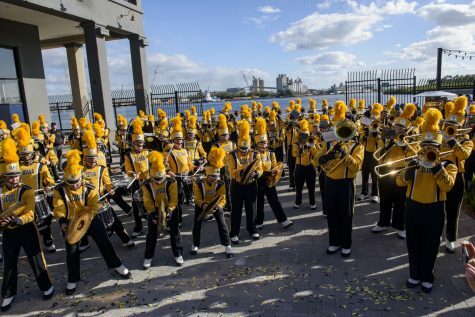 Iowa returns to the Outback Bowl, but this time, it’s Brian Ferentz in charge of calling plays. 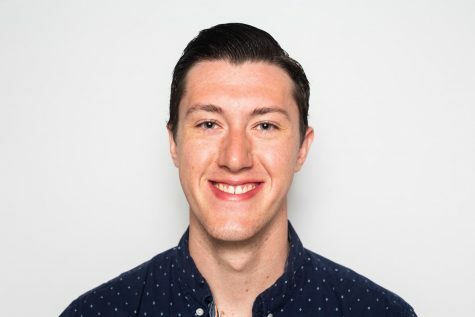 Iowa’s current offensive coordinator has had his fair share of mountain peaks and valleys, but after nearly two full seasons, it’s clear that this is a different Iowa offense. He’ll have his hands full against No. 18 Mississippi State, though. 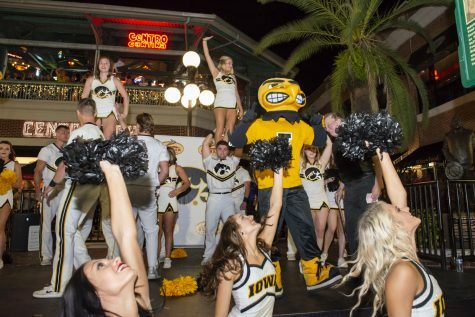 Come Jan. 1 in Iowa’s second dance in three seasons in Tampa, the Hawkeyes clash with one of the SEC’s best defenses. Mississippi State’s defense ranks 10th in rushing yards allowed per game (104.3) and sixth in passing yards (164.2). 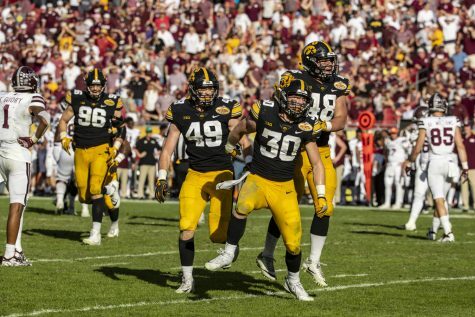 But, as Iowa has suffered offensive woes in the past two Outback trips (459 yards of total offense in both games combined), this isn’t the same Hawkeye offense in years past. Brian Ferentz’s scoring offense ranks in the top half of Iowa teams in the past 20 years. Under Kirk Ferentz, the Hawkeye offense has averaged 30 points or more in a single season six times. One of those years was this season. Through the regular season, Iowa averaged 31.5 points per game, which is the third-most under Kirk Ferentz. That 31.5 points per game ranks Iowa’s offense 47th in the country, just the seventh time in the past 20 seasons that it has ranked in the top 50. 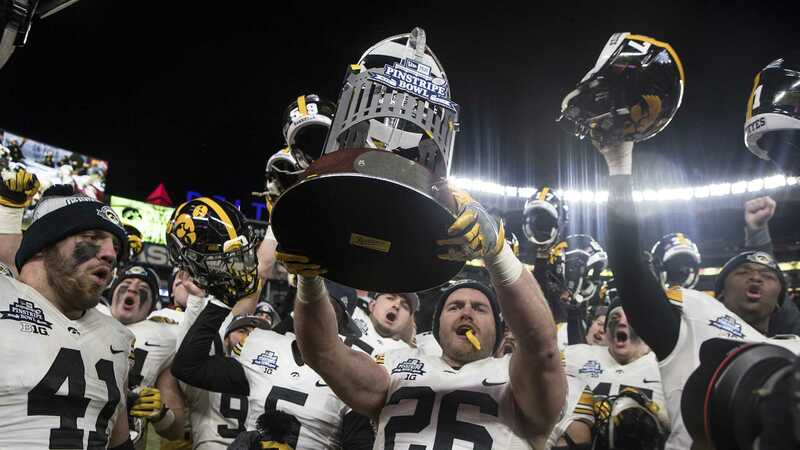 Excluding 2018, every season in which the Hawkeyes averaged 30 points or more featured at least 174.7 rushing yards per game. 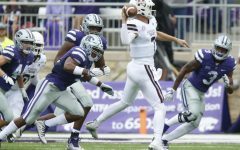 2018, however, featured the second-fewest rushing yards per game in the past six seasons, coming in at 162. 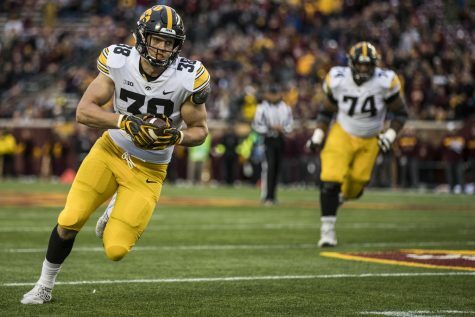 Kirk Ferentz’s bread and butter is a heavy dose of the ground game; in all but three of his 20 seasons, the Hawkeyes have ran for at least 114.2 yards per game. Through 12 games this season, Iowa’s 162 yards per game ranks 10th in Kirk Ferentz’s tenure. 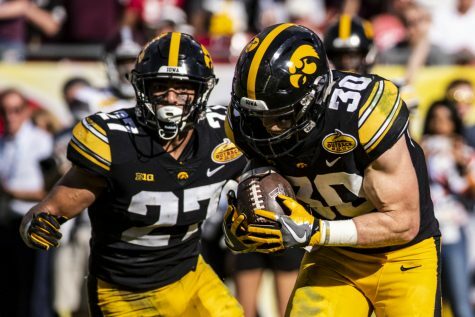 “Some weeks, the running game’s not going to be as strong — we’ve got to rely on the passing game,” Toren Young said after Iowa’s win over Nebraska. 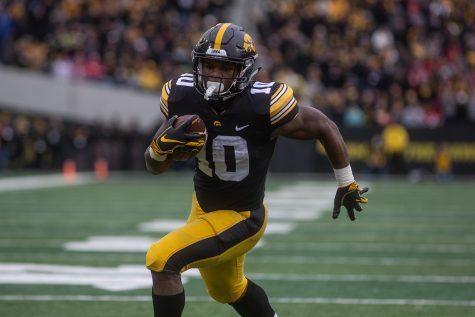 The running numbers picked up as the season went on; in the Hawkeyes’ finale against Nebraska, Iowa ran for 266 yards. Iowa ran the ball on 57.1 percent of plays in 2017, but that number shrank by 2 percentage points this season. Out of the Hawkeyes’ 840 plays in 2018, 44.9 percent of those have been passing plays. The scoring reflects those changes. The Hawkeyes averaged 2 touchdowns per game through the air, which ties for the third-most under Kirk Ferentz. In 2017, the team averaged 2.1, which ties for the most. Never once under Kirk Ferentz has Iowa’s offense averaged 2 or more passing touchdowns per game in consecutive seasons. From 2010-2011, the Hawkeyes came close, averaging 2 and 1.9, respectively. Point being, Iowa’s offense isn’t in new territory in terms of point production. What’s been innovative (on Brian Ferentz’s part) is how the Hawkeyes are scoring those points. In the past two seasons, at least 38.1 percent of the Hawkeyes’ scoring came from the passing game. 2017 was the high mark — 44.1 percent came through the air. Quarterback Nate Stanley has thrown for 49 career touchdowns in two seasons. Last year, he tied Brad Banks for the second-most touchdowns in a single season (26) and this season, his touchdown count (23) ranks sixth. 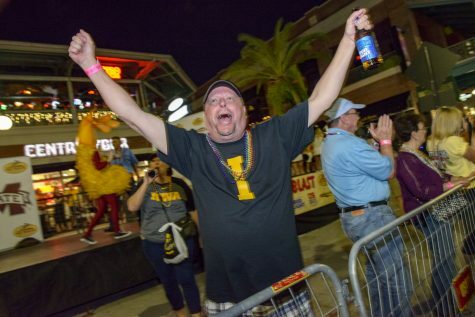 If Stanley throws at least 2 touchdowns against Mississippi State, he’ll become the first Hawkeye quarterback to have at least 25 touchdowns in two separate seasons, something not even Iowa legend Chuck Long managed to accomplish.